My manager asked me to build a prototype single page Flare output that implements a right-hand navigation that updates with scrolling. The example I was given was the documentation for the Bootstrap library. The documentation for Bootstrap uses Bootstrap. We used Bootstrap too. Here is how the prototype looks. The link after this image is a video clip of the scrolling behavior and the link after that is a live copy of the output. You can download a sample project from BootstrapExample.flprjzip. 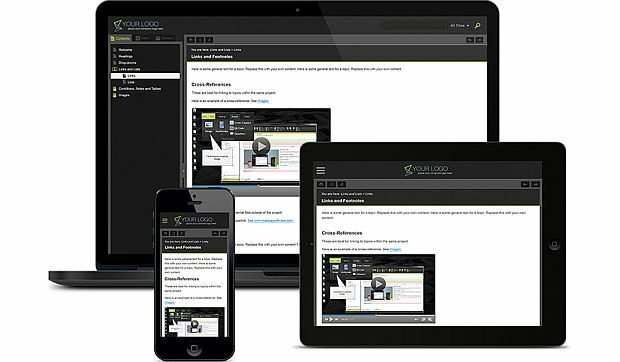 To change the content, you can adjust the topics in the Content.fltoc TOC. The XHTML Book target (SinglePage.fltar) is configured to build an output for another TOC (Master.fltoc) that contains Content.fltoc. If you want to make other kinds of adjustments, read the next section for more details about how this example works. There is a comments section or you can email info@tregner.com if you need more guidance. That target type is called XHTML Book. But we won’t be using the book viewer. You might say we are breathing new life into this target type. 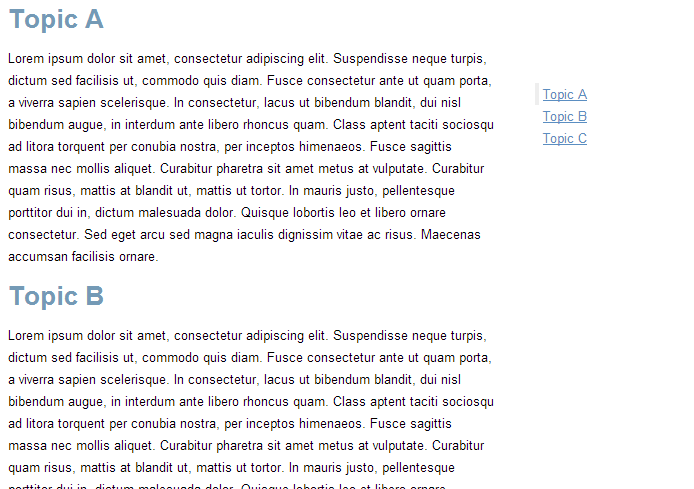 We are going to use the generated XHTML file and CSS and omit the TOC that can be generated at the top of the content. Let’s work up to that point and then do our scripting. Create a project. Use the Empty template. 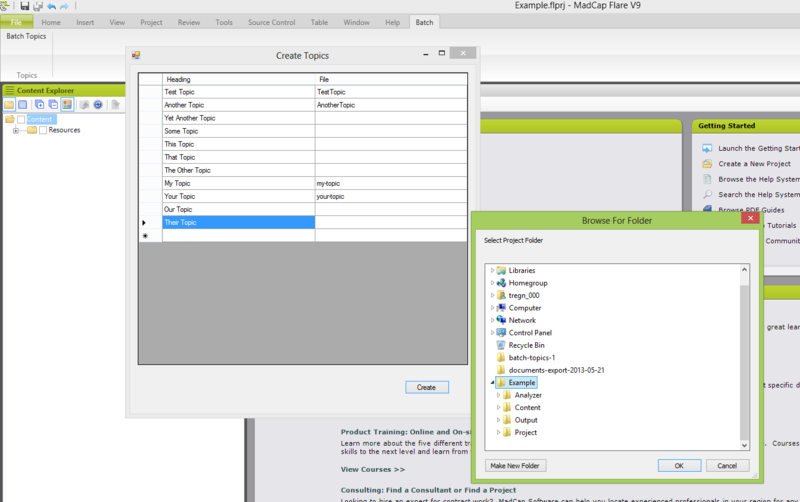 In Flare 10, we can’t select XHTML Book as the default target type from the New Project Wizard. Create some topics in the project. Let’s throw in some different heading levels for good measure. We’ll create a new TOC and add those topics to the TOC. We’ll reference the new TOC in the default TOC. The reason is we want to bookend the content TOC with some other utility topics but keep those from clouding the authored content. We can reuse those utility topics for other single page outputs. Now we’ll add an XHTML Book target. And we’ll explicitly reference the default (outer TOC) from the target. This is just to ensure that one is always used. We’ll select Modern.css as the Master Stylesheet. We’ll deselect the option to generate a TOC proxy and the other proxies. Now we have the basis for our single page output. Let’s build the target to see what we get. But we won’t view the output with the book viewer. Instead, we’ll open the output folder and look at the *.htm file. Let’s download Bootstrap and place it in our project in the Content\Resources folder. Now we’ll remove the headings from Scripts0.htm and Scripts1.htm. In Scripts0.htm, we’ll create script elements to load jQuery from a CDN (Content Delivery Network) and to load Bootstrap from the copy in the project. jQuery is a dependency for Bootstrap so that one goes first. In Scripts1.htm, we’ll add this markup to form the outer elements for our navigation and to load the script (single-page.js) we are about to create. We’ll also place this script in the Content\Resources folder in the project. In the example a subfolder is used. Much of this script adjusts the markup of the XHTML Book *.htm file to suit our needs. Many of the changes are to links and destinations. The script converts some of the cross reference information to true links. This involves sanitizing the strings for characters that are not valid in URL encoding. You may run into issues with some types of links in your content. You’ll have to adjust the script to handle those. This script covers the scenario where there is an absolute link with some of the more common schema names. The script leaves those alone. There are only two levels in the navigation. When the script builds the menu items, it places links in either the first level or as a child of a first level entry. First level entries are li elements with a link and a ul for children. Second level entries are li elements with links placed in a first level entry’s ul. The script places links to h1 elements in the first level and links to h2-h6 as second level entries. But the script can be adjusted if the division should be be somewhere else. 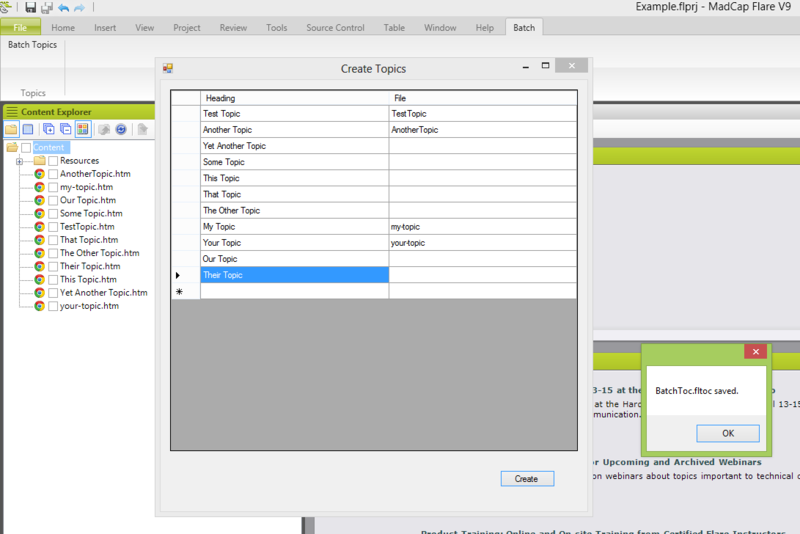 To accomplish that, edit the condition in the inner if statement to include other tags. Look for the comments to find that section of the script. Right now the condition is as follows. But to place h2 elements in the first level, the condition could be changed to this. Scrollspy is started with the following line. Some content may run into issues where the navigation tracks up an entry when a link in the menu is clicked. The overcome that, adjust the offset. //For existing links that are absolute, don't alter the value of href. //Handle a reasonable set of scheme names. //For those that aren't absolute, replace unfriendly characters with an underscore. //Replace madcap:xref elements with a elements. //but replace unfriendly characters with an underscore. //Set the value of the id attribute to that string. //create an item in the navigation menu. //and all other entries second level. //of heading elements as first level is desired. //Use affix for the nav location. //nav doesn't update. This helps with that. We’ll adjust the body element rules in Modern.css. This is so scrollspy plays well with the styling. Then we’ll add this to Modern.css. We’ll append the following to define how the navigation appears. Notice the left borders are used to indicate the active parts. There it is. We also used a smooth scrolling library in a version of our prototype to animate scrolling when links are clicked. That may be a short post at a later date. This entry was posted in Flare for Programmers and tagged Bootstrap, scrolling, scrollspy, single page, XHTML Book on April 4, 2014 by Thomas Tregner. 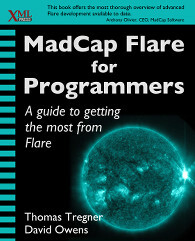 I want to draw your attention to another blog with some interesting posts about programming and scripting in the context of MadCap Flare. The Techwriting Engineer isn’t solely devoted to that. But here are three posts that the author, Mattias Sander, has selected that fit in with the theme of Flare for Programmers. So consider subscribing to the feed for The Techwriting Engineer and let’s see what Mattias comes up with! This entry was posted in Flare for Programmers and tagged blogs on March 12, 2014 by Thomas Tregner. This entry was posted in Flare for Programmers on October 2, 2013 by Thomas Tregner. Sometimes you just want to create a bunch of blank topics all at once and put all of those topics in a TOC. 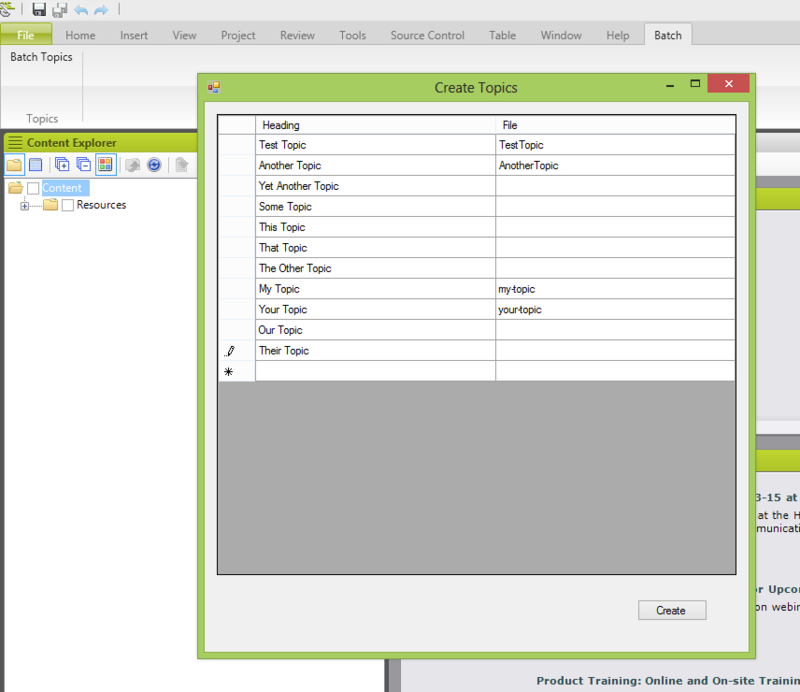 If you just want to try it, here is a plug-in DLL: BatchTopics.dll and help for MadCap’s Plug-in API. Use the code or the plug-in at your own risk. No warranty is offered. Let me know what you think in the comments. Edit (9/102013): There is additional information at MadBlog. Also the project and DLL were recently updated to fix a namespace issue. This entry was posted in Flare for Programmers on September 3, 2013 by Thomas Tregner.